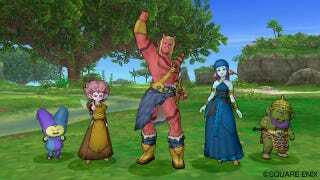 At Tokyo Game Show 2012, Square Enix held an event with special guests, Yuuji Horii, the creator of the Dragon Quest series, and producer Yousuke Saitou to showcase the Wii U version of Dragon Quest X. During the stage event, Horii was asked what the release date for the Wii U version of the game would be. Horii was evasive at first, but tentatively answered "Sometime next spring." Saitou stressed that this was not a set date but rather a target and that the development team was working hard towards release of the game. Saito also noted that allowing for players to use their Wii version characters in the Wii U version open beta was "technologically feasible" but did not make any definite statements as to if it would be implemented.